5) Lyse cells directly in 1X Laemmli buffer and sonicate. 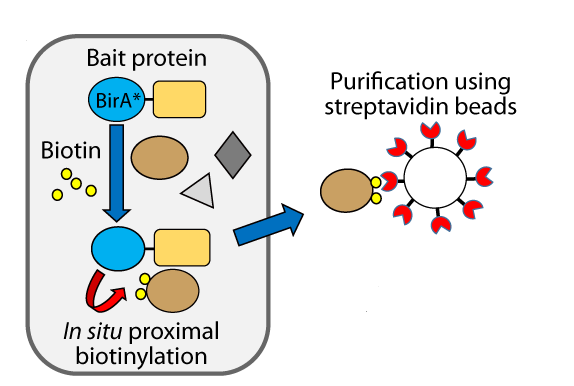 6) Incubate lysates with streptavidin-coupled beads for 3 hours at 4°C. 7) Pellet beads and wash 5 times with 1mL RIPA buffer. 8) Elute bound proteins by boiling at 100°C for 8 minutes in 2X Laemmli buffer. 9) Analyze eluted proteins by western blot or mass spec. Now a number of research articles have been published using the BioID method and have identified novel protein-protein interactions. Some researchers have noted differing results using N- or C-terminal BirA (R118G) tagging. At least part of this might come from the chimeric protein’s intracellular localization. Indeed an important step is to confirm that the BirA(R118G) fusion has the same intracellular localization as the protein of interest.